Finally, as previously discussed, we should update our maps and no longer look to the silk road like the one that China has wanted us to believe for four previous years, namely a Silk Road by land along Central Asia and a Silk Road by sea along the Indian ocean. This is not the real new silk road but there is “third way” through the Arctic route which, thanks to the melting of ice due to climate change, opens up new opportunities and risks decentralizing the strategic and geopolitical importance of the Mediterranean. The Mediterranean that risks being closed to the north by these new Arctic routes and to the south by the growing importance that Africa has in the eyes of China. Both major changes that could diminish the importance of the Suez Canal and therefore of the Mediterranean itself. To make the problem even more serious is the ever-diminishing relative economic importance of the so-called PIGS southern European countries, while China looks with increasing interest to the countries of Northern Europe and Scandinavia. This is why the port of Trieste is attracting the interest of China precisely because it has a direct route to the port of Kiel in the Baltic Sea and from there with the StenaLine to Scandinavia and not because it has a line from Trieste to Sicily. 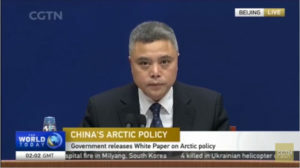 In the document published by the Chinese Government, China’s strategy towards the Arctic is made clear for the first time, and it also provides the theoretical background that supports China’s interest in this part of the world. 1) Although China is not an Arctic country, it is close to the Arctic itself and all the changes taking place in the Arctic have a direct impact on the environment, on the Chinese agriculture economy, on the maritime industry and on the forestry industry in China. 2) China has always cooperated on international issues, especially on global challenges such as climate change and the exploration and development of new natural resources, problems that can not be solved only by countries close to the Arctic, especially since China is both a major producer and a major energy consumer. 3) China participates and will continue to participate in the regulation of the Arctic, the use of its resources in cooperation with other countries in the interest of the whole world and world cooperation. In short, China has decided to take the Arctic seriously. But in all maps used until today to illustrate the One Belt One Road, the Arctic was not there..on purpose, or almost. A classic example is the opening of the structure for the liquefaction of natural gas LNG in the Yamal peninsula in Arctic Russia. The purpose of the plant is the extraction of the gas, the liquefaction and loading it on ice-tankers that transfer it to China. 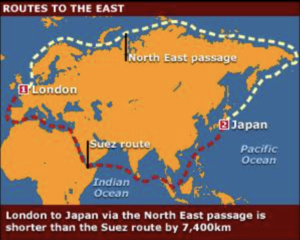 And here for the first time, even the maps of the new Silk Road will have the arrows from the west to China. Something never seen before. I conclude with a trivial question: what is the official Italian policy regarding the Arctic?